Without realizing it this post is my 500th blog post. Technically it's really not. I say that because 1) I had an older blog for a year prior to starting The Bicycle-Chef. Some of those early recipe blog posts have migrated over to here. 2) I've added and deleted posts from this blog; I'm not sure how many posts I've actually written. Rather than wait weeks and try to roll out a big hoopla post, replete with videos, photo montages and self-congratulatory back pats, I'll post this lovely recipe. Video highlights can always be done at a later date! Onto recipe writing. 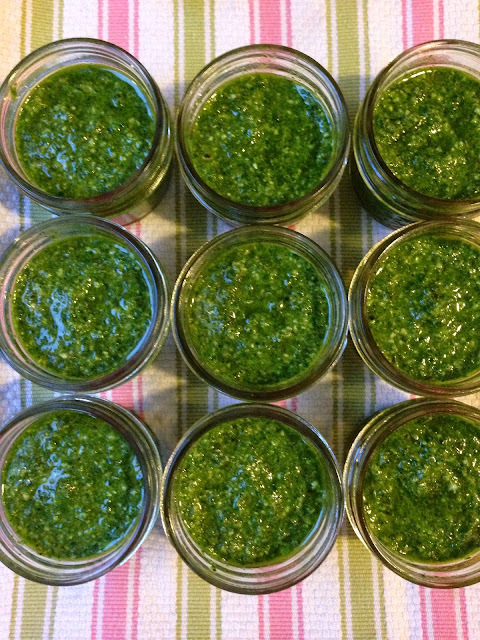 For a recent food swap I attended with The South Jersey Food Swappers, I made a batch of pesto, using kale as the basis for the pesto. I had kale pesto at a food swap a year ago and I was so taken with it I knew I wanted to make it. It took me a year but the wait was worth it! I adapt things all the time, tossing ingredients in until they "taste right" to me. 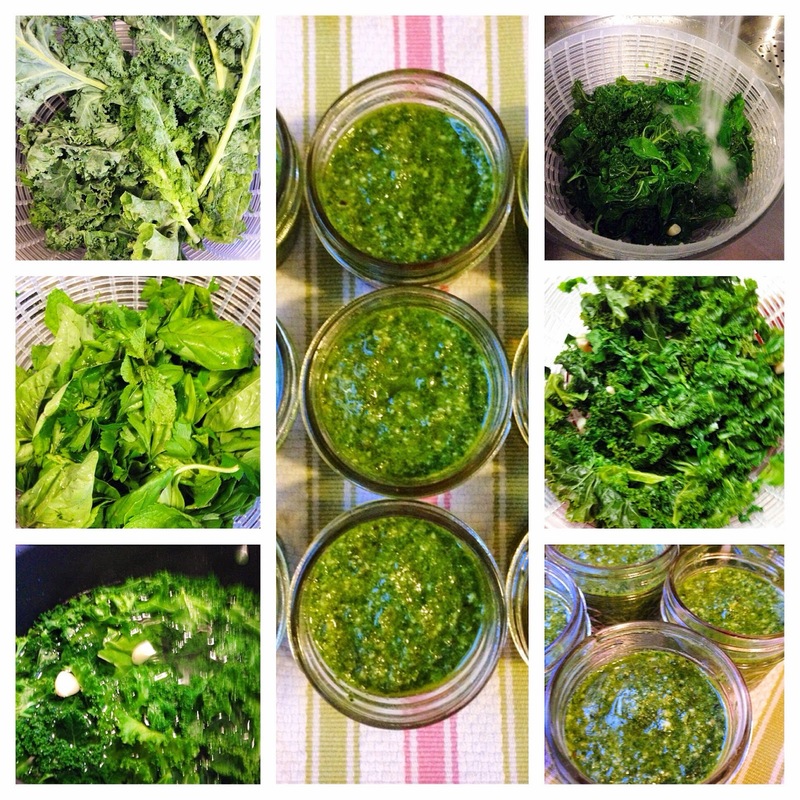 My friend, Jamie Lynn, made the original batch of Kale Pesto. I'm not sure what all she had in hers, maybe some basil; perhaps a bit of cheese; certainly olive oil. I figured I'd give this a whirl and see how it turned out. 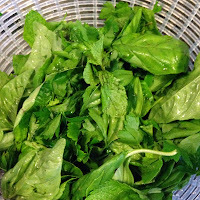 Making pesto with kale couldn't be any harder than making it with a variety of herbs, including the all-important basil. I made ten 4 ounce jars for the swap, and one 6 ounce jar for sampling. My "actual" recipe would therefore make 5 to 6 cups of pesto. I'll try to cut this down to a more manageable amount for home use - 2 cups max. 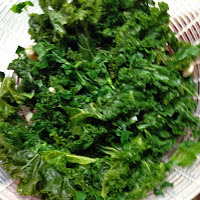 It's all about handfuls of ingredients; blanching the kale to tame the bite; and whizzing everything in a food processor to get it lusciously smooth. This pesto was: Blanched kale and blanched garlic; basil, parsley, mint, toasted walnuts, olive oil, and Pecorino Romano cheese (it's cheaper than Parmesan), salt and pepper. The kale helps stretch the pesto and adds a healthy veg to the mix. 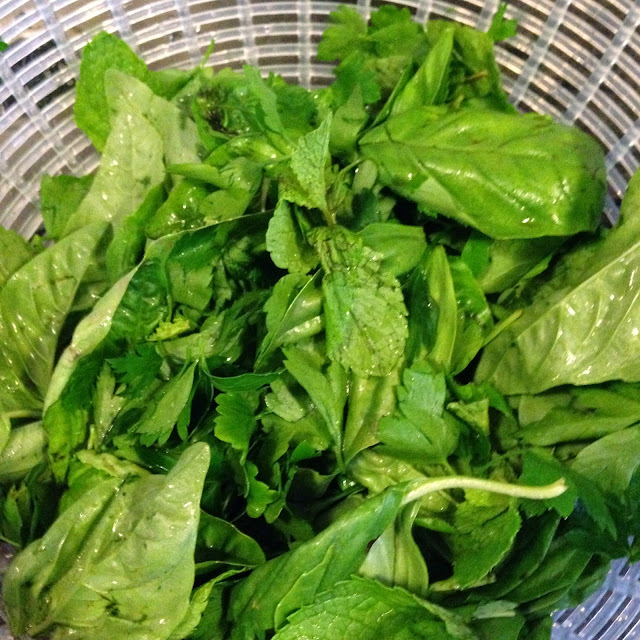 Using parsley and mint help with the taste, adding in a sweeter element to work with the basil. I picked walnuts instead of pine nuts because they are less expensive and because they have a softer taste than the bitter edge that pine nuts can sometimes add. The recipe can be worked to suit your tastes and needs. 1. Clean the kale, basil, parsley and mint Set aside. 2. Bring a large pot of water to a rolling boil. Add in a tablespoon of salt. 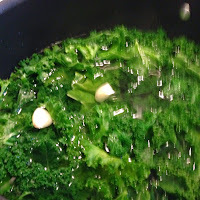 Next, add in the de-stemmed kale leaves and cook for 5 minutes. Add in the garlic after 5 minutes and cook for 1 minute more. 3. 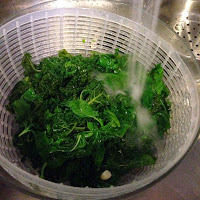 Put the basil leaves, parsley and mint into a colander and then drain the blanched kale and garlic leaves in that same colander, pouring the hot water over the herb leaves. Drain, and then immediately run cold water over everything to stop the cooking process. 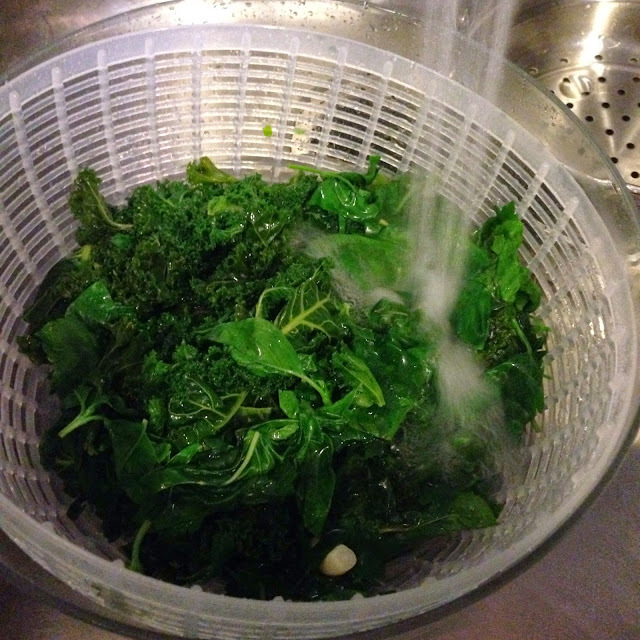 Squeeze the kale and herbs dry, wringing out as much water as possible. 4. 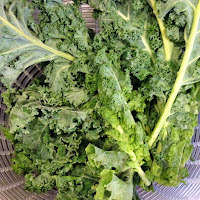 Add the blanched kale, garlic and herbs, basil and parsley, into the work bowl of a food processor fitted with the blade attachment or into a large/heavy duty blender. Pulse a few times to get the leaves to start forming a paste. Keep the the lid on the blender or food processor and the machine running, drizzle in the olive oil in a slow stream through the pin-hole or removable lid of the blender or food processor. The mixture should form a paste. If need be, turn off the machine, and scrape down the sides of the work bowl. Replace lid and turn the machine back on and continue adding in the oil. The mixture should be thick, not runny, but should also be a bit loose. 5. Scrap down the sides of the work bowl or blender and add in the walnuts, then season to taste with salt and freshly ground black pepper. Pulse a few more times to grind the nuts. Lastly, add in the cheese and pulse a few more times. Taste and adjust seasonings as needed. 6. Store the pesto tightly covered and refrigerated. Pesto without the cheese added to it can be frozen for up to 3 months. 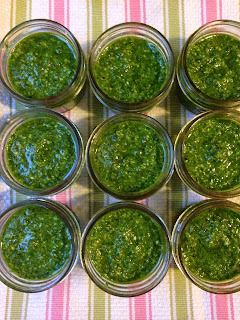 This pesto will keep, refrigerated, for up to 1 week. 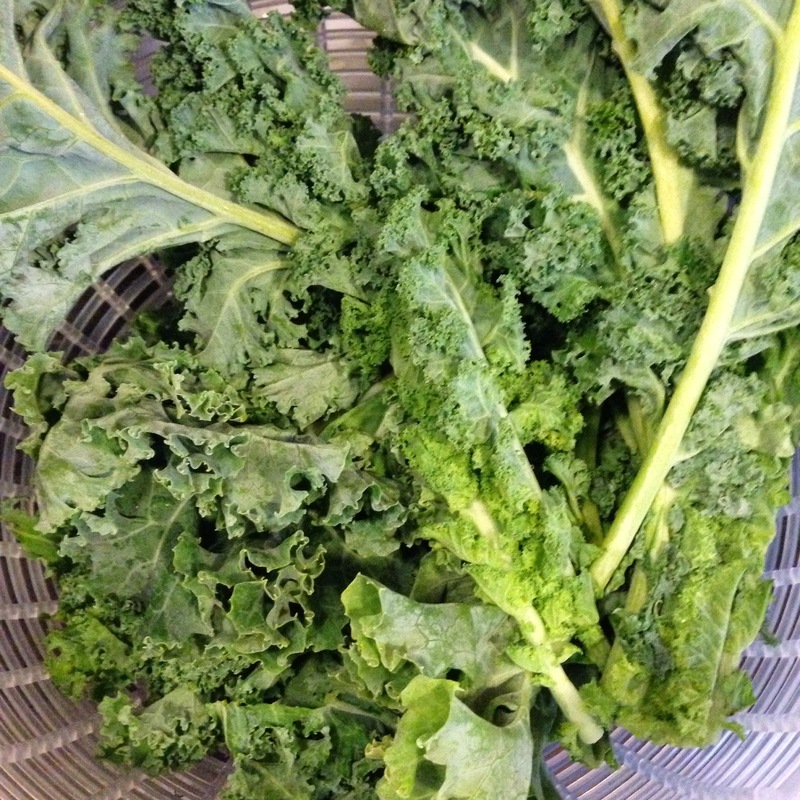 Adding the kale to it will help maintain its intense green colour. Makes 1 to 1 1/2 cups. Add more of each, kale, basil, parsley, mint, oil, as needed. My recipes, as usual, are a casual affair. I usually toss in ingredients until I think they are where I want them to be!